Here is a video that will send shivers down your spine! The video clip shows two men on a Hero Splendor riding through Chandrapur, in Maharashtra’s Tadoba wildlife reserve. As you might have guessed, the duo comes face to face with a wildlife animal. What’s even scarier is that there are not one but two animals, both rather menacing-looking tigers. 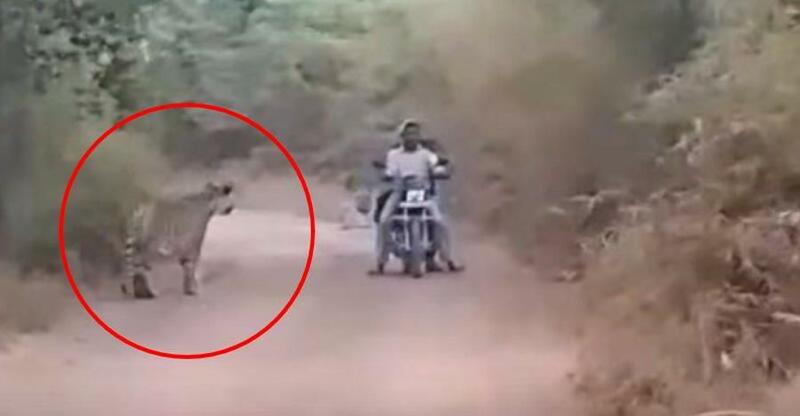 This video has been recorded by safari-goers in a Maruti Gypsy and in another vehicle. Fortunately, the safari-goers intervened as soon as one of the two tigers came too close to the motorcyclists. The video starts with the two bikers stopped in the middle of a forest trail. The rather blurry video shows a tiger walking near the motorcyclists. Actually, this kuccha road is one of the many such trails that pass through the Tadoba Andhari wildlife reserve near Nagpur, Maharashtra. It may be noted here that Tadoba has one of the highest tiger populations in the country. Many safari-goers have reported multiple spotting of tigers. In this case, the motorcyclists were confronted by tigers at both the front and rear. The bikers stood still for several moments, probably stunned by the sudden confrontation. Meanwhile, the tourists in the Gypsy recorded the whole incident on camera, with the forest ranger and the driver of the Gypsy shouting instructions to the bikers. After about three minutes, the tiger at the front starts inching towards the motorcycle. At this point, the Gypsy decides to drive to a point between the tiger and the bikers, thereby giving the motorcyclist some time to escape. It’s quite apparent that the timely action by the Forest Department driver saved the two motorcyclists. There have been many incidents of road users encountering wild animals. While the forest department officers are used to such wild animal spottings, such encounters can really scare the living daylight out of unsuspecting road users. Following are a few things that should be kept in mind after spotting a potentially dangerous animal. Don’t make loud noises or sudden movements. In case the animal has blocked the way, it’s advisable to stop completely and be still. Never panic in such situations. Doing so can startle the animal and it may attack you. Also, remember that it’s you who is in the animal’s territory and not vice versa. Hence, respect the animals and don’t do anything to make them feel threatened. Also, never ever offer food to the wild animals. These animals can develop a habit and can attack other road users in case they don’t get food from them.